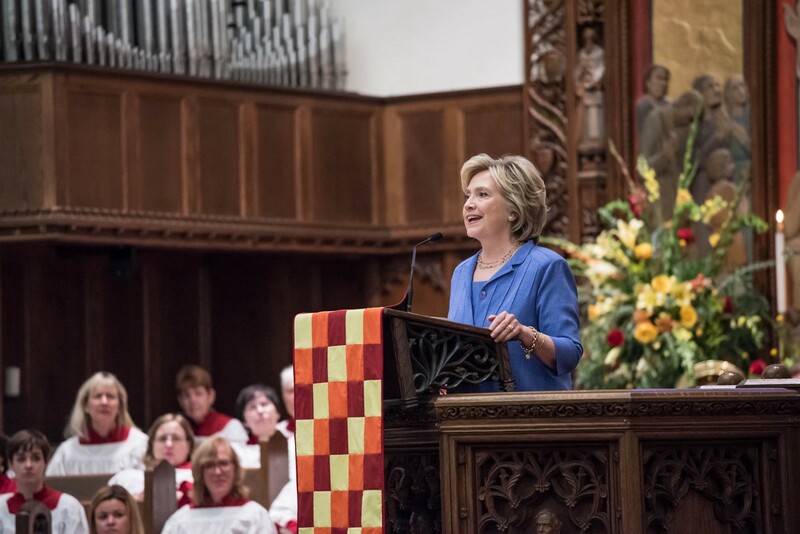 On Sunday, September 13th, Hillary delivered a sermon at Foundry United Methodist Church in Washington, D.C.
Good morning. This is the day the Lord has made; let us rejoice and be glad in it. And especially for this occasion, a remarkable event that we are celebrating together. I am so glad that Chelsea and I could be part of it. I thank you for that invitation. I was thinking, as Chelsea was speaking, how unpredictable, even serendipitous it turned out to be that we ended up at Foundry. Some of you may remember it was not too long after the inauguration. It was a Sunday. We were already getting kind of stir-crazy, and so we thought, “Let’s go to church.” Now, this was a long time ago — 1993. There had been a big storm in Washington. The drifting snow was stacked in the streets and on the sides. We had the idea that we would find a Methodist church and walk from the White House. I don’t know who was there that day. Some of you were very, very kind in bringing us in. This was the time before metal detectors and all of the hyper-security that we live with today. We just walked out of the White House followed by some bewildered Secret Service agents and made our way to church. And from that moment until this, we have always felt so welcome. 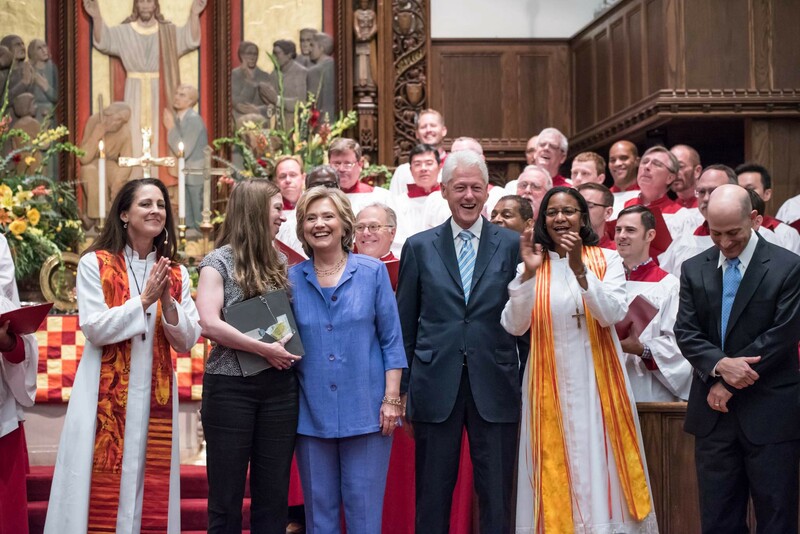 As I was listening to Chelsea and remembering those early weeks and months here in Washington for us, and how thrilled I was that she found so much support here, I of course thought about my own Methodist church growing up in Park Ridge, Illinois, where I had the same kind of experience. I am a Methodist both by birth and by choice. I was born into a Methodist family — parents, grandparents, great-grandparents, claiming to go all the way back to the coalfields hearing the Wesleys preach. Now, as with so much inherited family lore, I am sure the press will dive on that and try to figure it out. All I can tell you is what my grandparents told me. And that church really opened my eyes, my mind, and my heart — especially my youth minister, who forced us out of our comfort zone, who made us have to really live in what John Wesley called “his parish,” meaning the world, in ways that were a little bit discomforting, to be fair. This was a youth minister who said no, you can’t just be sitting satisfied in your own church in a suburb of Chicago that was all white. We’re going into the inner city of Chicago. We’re going to go into church basements and have fellowship with youth from African American churches and Hispanic churches. We’re going to sit and we’re going to talk about our lives. And we did. A youth minister said one day, “I’m going to go see Dr. Martin Luther King, Jr., speak in Chicago. If your parents will let you go, I will take you.” My parents let me go; not every parent did. And we got in that church van and we went down to Orchestra Hall and we heard Dr. King. And I remember standing in that long line just to shake his hand after hearing one of his famous sermons, “Remaining Awake Through A Great Revolution.” I’ve read that many times since, trying to absorb even more than the first impression that I felt so strongly. I left that hall a different person thanks to my church. When I went to college, I looked for a church and I found a Methodist church that once again I felt could be part of my new experience, my own journey. And in place after place after place, the Methodist church and my fellow Methodists have been a source of support, of honest reflection, of candid critique. I got some advice from Dr. Wogamon just earlier this morning. Which I promise I will put into effect. He basically said, “You know, if you’re going to read and listen to Romans 12, you’ve got to be nicer to the press.” So, to my friends in the press, I will certainly take that to heart. Now, I attribute not only my church relationship to my father’s family, because that’s where it came down to me, but to my mother. She taught Sunday school. She said later she did it to make sure my brothers would show up. She was very focused on the lessons of John Wesley. I thought that was good advice then. It’s not always easy to implement, but it’s a great reminder that I carry around with me to try to get me back focused when life and its vicissitudes sometimes knock you off the path. I’ve come to see how important it is that we always be asking ourselves how we do translate our faith into actions. We heard from Meaghan one of my favorite verses in Romans 12. “We all have different gifts, according to the grace given to each of us.” Another lesson I learned from my mother. Abandoned and mistreated by her own family, sent by her parents to live with grandparents; rejected by them. She was on her own by the age of 14, working as a housemaid. I didn’t know any of this when I was a little girl and we would go off to church on Sunday or we would do something around the house or at school. I just knew she was a great mom. Years later, I asked: How did you keep going in the face of abandonment and rejection? How did you not give in completely to bitterness and despair? How did you keep your faith in the goodness of people and a future that could be better than the past? And here’s what she said. She said along the way, someone showed her kindness. Someone showed her that they believed she mattered. The first grade teacher who saw she had nothing to eat at lunch, and after a few days, without embarrassing her or calling attention to her, walked over and knelt down and said, “You know, Dorothy, I just brought too much food today. Would you like my extra food?” And years later, my mother realized that her teacher fed her every day. Or even the woman whose house she was cleaning at the age of 14, who realized that my mother desperately wanted to go to high school. And this woman said to her, “If you get your work done, you can go to high school. You can leave in the morning and come right back.” Now, to some that might sound harsh for a 14-year-old, but for my mother it was a great gift. So every day she would get up early, she would do her work, and she would literally run to high school, and then after it was over she would run back. Because people believed in her, she was able to believe in herself and believe in me and others whose lives she touched, like my husband and my daughter. And she was able to give us the great gift of believing in others. The longer I live, the more places I go and people I meet, the more certain I am that everyone has gifts to be recognized and celebrated. No matter who you are, where you come from, what your income, your race, your religion, your gender, your age, your ability — you have value. You have dignity. You have something to offer God and the world. Now, we don’t all have the same gifts and blessings, but that’s okay. In fact, it’s good. That’s Paul’s message in Romans 12. Because together, our contributions add up to something greater than anything we could offer on our own. And isn’t that the goal of a community or a congregation? The meaning of what I used to call “a village.” It takes a village, it takes a community, it takes a congregation to lift us all up and to empower us to do our part. The Apostle Paul is pretty clear that we can’t just celebrate our gifts, we’ve got to use them, especially in service of others and in service of a better, fairer and more peaceful world. We should be — in Paul’s words — generous and diligent and cheerful in our service. That’s how we honor God, who gave us these gifts in the first place. In that way, Dr. King said, we learn to love ourselves. “Love your neighbor as yourself” doesn’t mean much unless you love yourself first. We aspire to use our gifts to the fullest, and that’s what gives us the grace and strength to truly love and serve God and one another. I see a second challenge in Paul’s letter to the Romans, and I think it’s particularly relevant today — for our nation, and for this church as it enters its third century. It’s not enough to just use our gifts. We also have to make it possible for other people to discover and use their gifts too. The truth is there are so many people in this community, in our country, in our world, who have so much to offer — but never get the chance to live up to their God-given potential. Talent is universal, but opportunity is not yet. Too many people are held back by economic pressures and social barriers. It’s still too hard for too many to find a good job that pays enough to support a middle-class life. Too many children don’t get the education they need to succeed, and too many families find that no matter how hard they work, they just can’t get ahead. And as we’ve been reminded again and again recently, there are still hard truths to face about race, gender, and sexual orientation in America. Now, too many people want to let their light shine, but they can’t quite get out from under that bushel basket. It is way too heavy to lift alone, and that’s where the village comes in. Together, as a church, a community, and yes, a country, we can open doors that are still closed. We can lift each other up and leave no one behind. We can unlock the potential of every American. And when we do that, we will unlock the potential of America itself. Foundry has helped people for the past 200 years discover their gifts every day through worship, hospitality, community outreach, interfaith dialogues, the youth ministry, and millions of other expressions of love, faith, and service to this community and around the world. “Love God, love each other, change the world.” — that’s the Foundry way. Now, it also says elsewhere in the New Testament, in James, that, “Faith without works is dead.” But we know that grace and salvation are unmerited gifts from God. The question is what we do with those gifts — to use that gift of grace wisely, to reflect the love of God and the sacrifice of Jesus Christ to the greater good of God’s beloved community. So thank you, Foundry. Our family is just one of so many over the past 200 years that this church has inspired. We are proud and grateful to be members of this community. We hope that in the years ahead, Foundry’s mission just grows deeper and stronger. That many more people will feel the embrace, the support, the love and acceptance. Shortly after we came to Foundry, this church became a reconciling congregation, which only added to our joy of being part of it. The movement for reconciling goes on. The movement for healing, for reaching out, for loving and serving will never end. In addition to this being a special day for Foundry, it’s a special day for my family because we have been given so much — to the church we walked into on that snowy day so many years ago. And of course, it doesn’t get any better than the fact that today is also Grandparents Day. So this is just a winner all the way around. But let us rejoice in this day that, yes, the Lord has made, and 200 years of hard work has built a congregation, a church in our capital city that serves as a kind of reminder, if you will, every single day of what we truly are called to do. Let us remember that and let us go forward with the hope and commitment to make this church the living example of how to live as described by Paul in Romans 12. Wife, mom, grandma, women+kids advocate, FLOTUS, Senator, SecState, hair icon, pantsuit aficionado, 2016 presidential candidate. Stories from the campaign trail, moments in history, ideas to help Americans get ahead and stay ahead.